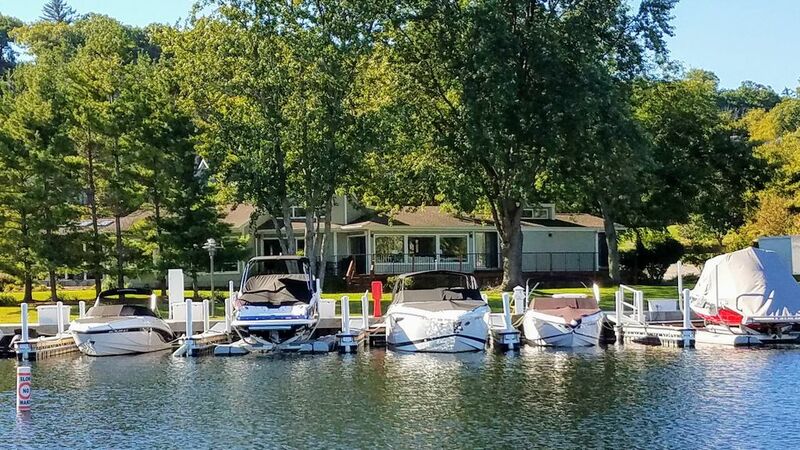 WEEKLY RENTALS - Sunday to Sunday (Summer months) This executive-quality private waterfront home offers the best combination of private, deluxe accommodations and resort amenities available anywhere on Geneva Lake. Experience all of the benefits of a world class resort just steps from your waterfront deck! If you're looking for outstanding location, quality, and amenities, this property is unique! Relax and be pampered at the Avani Spa at The Abbey Resort, or hit the waves, the pool, or the beach. Everything you need is right here. Leave your car parked for your full stay – everything is so close. beautiful sunsets from the large waterfront deck or the 360 sq ft screened porch! - 1/3 acre level lot with 165’ of marina frontage. - Large fireplace centered in the huge, spacious great room - 50" big-screen plasma TV for enjoying great movies or sports events - Air Conditioned, vaulted ceilings - Guest / children's "wing" for privacy. - Microwave, dishwasher, cable TV, WIFI - Newly redecorated: granite counter tops, all-wood floors - Large screened porch with skylights extends your outdoor enjoyment! the latest “water toys” are all available to rent. - Stroll to the famous Avani Spa at the Abbey Resort. - A golfer's paradise! Choose from 8 courses within 10 minutes drive! - Fabulous dining and nightlife - all within walking distance! In for a little nightlife? Walk to Lake Geneva’s hottest night spots: Gordy’s Boat House & Chuck’s, or visit the Abbey Waterfront lounge, regularly featuring live music!